(Daily Caller) When Barack Obama promised to slow the earth’s rising sea levels and heal the planet during the 2008 campaign, he probably had no idea that curbing carbon dioxide emissions might not lower the sea levels. A study published in the Journal of Geodesy found that the sea level has only risen by 1.7 millimeters per year over the last 110 years – about 6.7 inches per century – all while carbon dioxide concentrations in the air have risen by a third, suggesting that rising carbon concentrations have not impacted the rate at which sea levels are rising. The study used data from the Gravity Recovery And Climate Experiment satellite mission and analyzed “continental mass variations on a global scale, including both land-ice and land-water contributions, for 19 continental areas that exhibited significant signals” over a nine-year period from 2002 to 2011. The results echoed a study conducted last year, which also found that sea level has been rising on average by 1.7 mm/year over the last 110 years. This was also suggested by two other studies conducted in the last decade. Well, that’s just a fastball to the groin, wouldn’t you say, Warmists? Of course, Warmists will say “see? We were right. The sea level is going up!” Yes, yes it is. Alas, what this confirms is that global sea level rise is pretty much within the statistical norm. What does that mean? 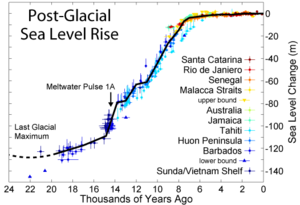 Essentially, over the last 7,000-8,000 years the sea rise has been estimated to be an average of 6-8 inches per century. The reason that time frame is used is due to the effects of the ending of the last glacial age leveling off. From around 20k years ago, the sea rose roughly up to 140 meters (459 feet) in roughly 13,000 years, heading into the Holocene. Now, think back to math class: how does one arrive at an average? We take a bunch of numbers, add them together, and divide by the number of data points. What this means is that during the past 7-8K years, there have been times where sea rise has been much higher warm periods), and times where much lower, perhaps even negative (cool periods). Yet, this warm period is simply average regarding sea rise. Of course, what Warmists will tell us … if they even acknowledge the study… is that maybe it’s at the lower edge of average now, but in the future, dooooooom! And then they’ll jump in their fossil fueled SUVs to run errands. PS: Just to be perfectly clear, the Earth is currently in a warm period, which could last for another couple hundred years, but, once again, we see that it is primarily natural, not driven by CO2.